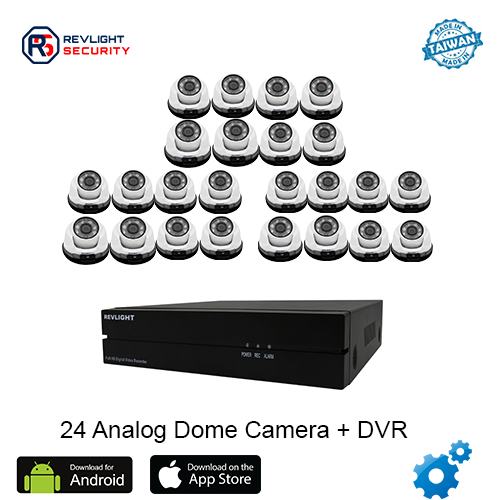 Our 24 Camera DVR Security System Consists of 24 analog camera including one 32 channel dvr system with 5 TB video recording storage, which has 1 year warranty. Know What Happened. 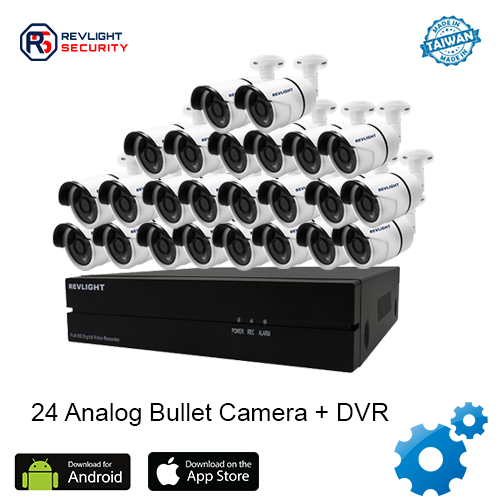 Get A 24 Camera DVR Security System. As a business, a number of issues can arise on a daily basis. Having a 24 Camera DVR Security System in place can help you, or your team, see what really happened assisting you in resolving conflicts. With easy mount brackets, these cameras can be installed easily, where you need them most on either the ceiling or walls. Indoor or outdoor, the weatherproof housing will protect this small, but capable analog camera from the fiercest of weather. Featuring 1080 lines of resolution you can see, with clarity like only the best HD CCTV security cameras allow. Get A Clear Picture WithRevlight Security’s HD CCTV Security Camera Systems High Resolution Cameras. Whether it’s a dispute between employees or an employee and customer, having it on tape – and even with sound! – you don’t have to rely on who to believe saving you potentially thousands of dollars. Choose to install a 32 surveillance security system and call our Revlight Security CCTV Team experts today for a free consultation at +65 6678-6557.